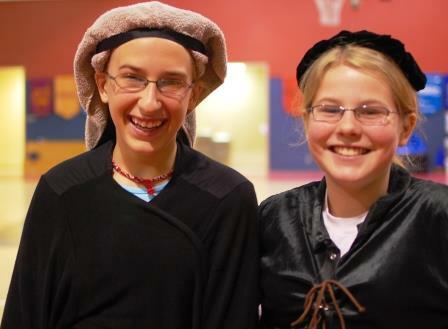 Remember that Renaissance costume review we did awhile back? That costume sure did come in handy for Diva's school's sixth grade Renaissance Fair this past week. Diva's 6th grade teacher was also my sixth grade teacher and our class was one of the first (if not the first) to participate in what would become the annual Renaissance Fair. 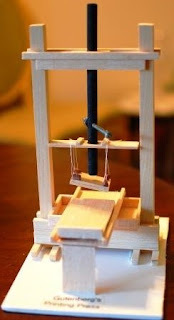 But boy has it advanced from our very crude beginnings. This project encompasses all subjects the last six weeks of school. I love this holistic style of learning and I especially love that almost all reports/projects are done at school. At home, we had to come up with a costume (thank you Anytime Costumes! ), a food for the feast (pinto beans), and an invention. If they wanted extra credit they could build a castle. We built a castle. As Diva was Gutenberg, her invention was the printing press. when you need help with a building project. 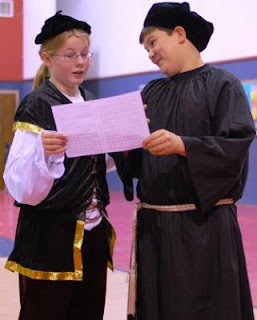 At school, the kids had to write a report on their invention, one on a famous Renaissance artist, one on their famous person, a fable which was then scripted by them in Illuminated text, create a coat of arms, recreate a painting by their artist, and complete a questionnaire to be used in an interview in front of a live audience. 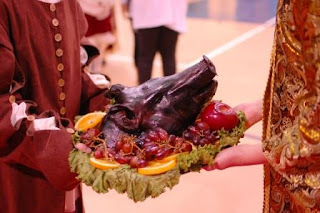 I was asked to come in last minute and teach the kiddos "The Boar's Head Carol" to be sung as they processed the actual boar's head through the school halls. I was also asked to teach Martin Luther a hymn that he wrote to be sung as part of the blessing before the meal. He, Diva, and I sang it together on the day. Diva, er, I mean Gutenberg and one of her best friends Marco Polo on the day. These students worked so hard and it was an amazing way to end the school year. And the best part? The next day, we all went to Medieval Times to solidify what they had learned.